Sonic Arts For All! is pleased to announce our partnership with Powrplnt as we begin our digital music workshop residency for teens, starting on Thursday, September 8, and continuing every Thursday throughout September and October. Our director, Max Alper, will host and facilitate the workshops with help from special guests each week who will bring their particular set of skills in electronic music to the table. These workshops will consist of group listening exercises, new lessons each week pertaining to a particular concept or interface, and individual project time to demonstrate said concepts. And while exposing the Powrplnt students to new musical ideas and styles while relating them to their favorite artists, we hope to build a set of technical skills for each student that will last them a lifetime. The SAFA! Team will provide the equipment for each week, as well as consult students and their families on how to utilize the technology available to them for musical means. Sonic Arts For All is pleased to announce we are now offering private digital music workshops for students of all learning styles. Through these private Summer and afterschool sessions, students will be able to learn the ins and outs of composition, arrangement, and production. They will be using various interactive digital interfaces such as tablet computers, touch based synthesizers and sequencers, and personal recording devices. SAFA! One-on-One is a mobile project that can meet with students anywhere in the five boroughs. We also have a workshop residency at the Brooklyn College Center For Computer Music so students can further experience our workshops in a professional studio setting. They will also be able to utilize the technology that the Center provides for their own creative projects. To sign up today for SAFA! One-on-One, please email outreach@sonicartsforall.org with the subject: SAFA! One-on-One. In 2016, SAFA! hosted afterschool music tech workshops every Friday for the middle and high school participants of the Brooklyn College Art Lab in Flatbush, made possible by the Brooklyn College Community Partnership! In August 2016, Sonic Arts For All! 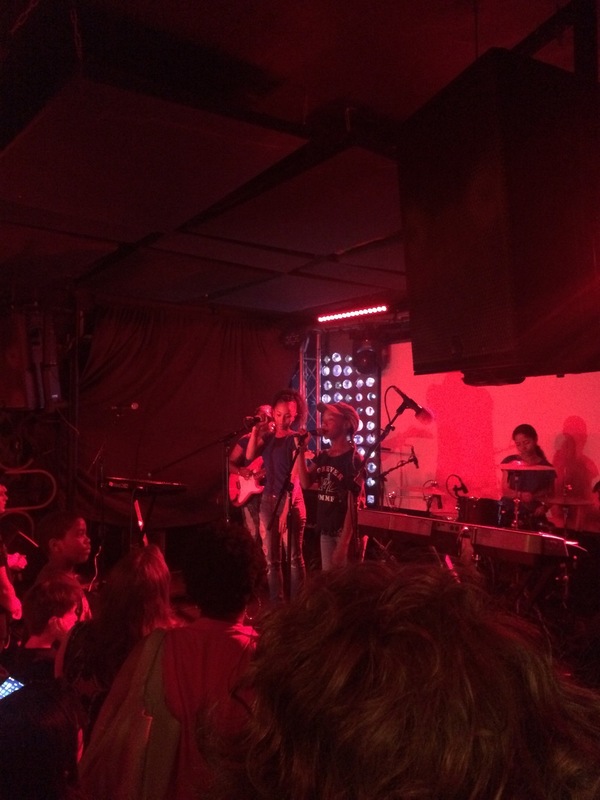 partnered up with We Make Noise as they presented their 9th Summer of NYC Rock Camp, located at the Bushwick Campus School. SAFA! provided tablet computers loaded with digital music apps from developers such as Moog and Korg, as well synthesizers and microphones, for the campers in their recording and hip-hop production classes. SAFA! also provided direct consultation in special education for specific campers attending during the week. The camp culminated on August 8th with an afternoon showcase of the campers bands and recordings at Baby's All Right in Williamsburg, Brooklyn. SAFA! founder Max Alper visited the Charles River Creative Arts Program on July 13th, 2016 as a guest artist. He sat in on multiple music classes, as well as performed and collaborated with the campers to create some weird sounds of their own. During the daily Noontime Show, Max gave an artist talk with CRCAP director Aaron Gelb, as well as performed solo, with the Creative Starts group, and the Creative Music Alliance ensemble class. During classes such as Creative Music Alliance and Digital Music, Max held group critiques, where students would present their work, and Max would initiative conversations amongst the students on how each piece could be improved. All classes of the day were modeled on college-level conservatory composition workshops. Workshop topics included free improvisation, musique concréte, arrangement and composition in Garageband and Logic, live effects processing, looping and feedback, and much more! All photos by Jack Beal. Be on the lookout for future collaborations between SAFA! and CRCAP in the academic year! SAFA! is thrilled to announce an official partnership with The Conservatory on the Highlands, a new music school start-up located in Newton Highlands, Massachusetts. On July 14th, 2016, SAFA! founder Max Alper visited the conservatory to give a digital music workshops to students, young and old, at the Conservatory. Topics included utilizing accessible technology at home (such as iPads and other tablets), sequencer apps and hardware, live effects processing, group improvisation, and arrangement through live looping. Be on the lookout for more SAFA! workshops in digital music at The Conservatory on the Highlands during the academic year!